Welcome to Two Dogs Southwest Gallery, where you'll find 100% authentic handcrafted Authentic Native American Jewelry from over 2000 Native American artisans. 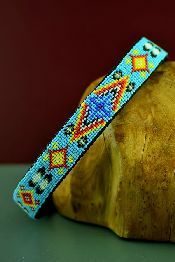 We also carry Native American Arts, Native American Beadwork and Zuni Fetishes. 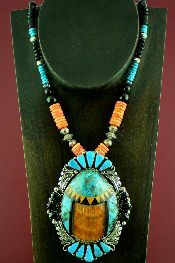 We invite you to compare our Southwestern Jewelry selection, quality, service and price with our competition. 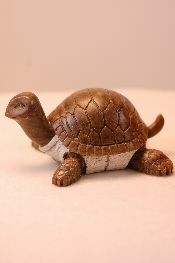 We hand select all of our merchandise so that we are able to bring you unique pieces that are not only beautiful but also have the quality of workmanship that our business is known for. Contact us at 602-739-2821 with any questions about our American Indian jewelry! Our website features a wonderful variety of one-of-a-kind Authentic Native American Jewelry and arts at the lowest prices possible. 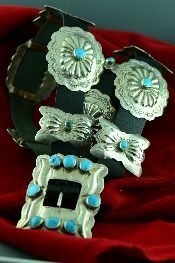 Two Dogs Southwest Gallery is also one of the finest online retailers of authentic Southwestern jewelry. 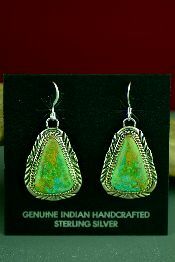 We are proud to offer our customers the very best in quality handcrafted American Indian jewelry. We hand select all of our merchandise so that we are able to bring you unique pieces that are not only beautiful but also have the quality of workmanship that our business is known for. 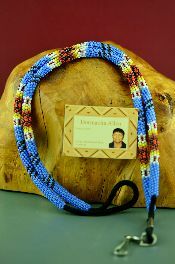 For over 43 years our family business has specialized in jewelry from over 20 different Native American tribes. 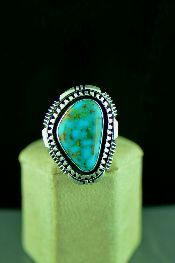 You'll find the finest Native American jewelers represented on our site! 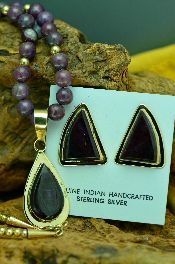 We offer both sterling silver and gold jewelry designed in the spirit of the Southwest using incredible natural stones. The stones used are turquoise, amethyst, charoite, coral, sugilite, topaz, and many more. 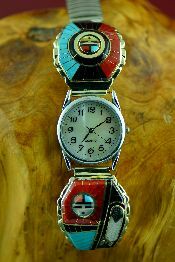 Our site contains beautiful American Indian Jewelry in one-of-a-kind bracelets, rings, belt buckles, bolo ties, earrings, pendants, watch bands, and necklaces including squash blossoms that are hand selected. 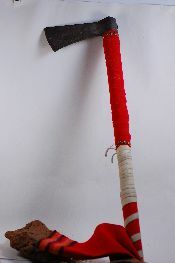 We also carry a fine assortment of Native American arts and crafts such as rugs, custom knives, beadwork, horsehair baskets and Zuni fetishes. As we continually add new items to our inventory, please remember to check back often. If you do not see what you're looking for, please email us and let us help you find the perfect piece to wear or display in your home. 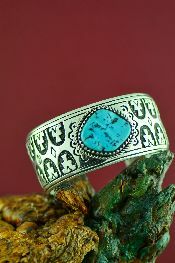 Turquoise Jewelry has captivated man's imagination for centuries. The robin's egg blue gemstone, worn by Pharaohs and Aztec kings, is probably one of the oldest gemstones known. Today it makes a great fashion statement! 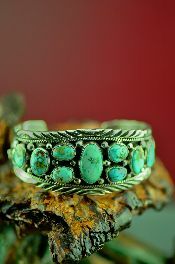 Turquoise has been extensively used by Native American Indians for centuries. They use it in ceremonials and everyday life. 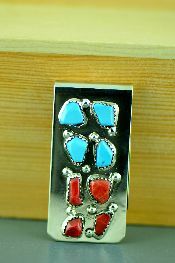 American Indians consider turquoise to be the stone of life, good fortune, and as a symbol of life. It is also called the sky stone. Native American jewelers create some of the finest turquoise jewelry in the world. Turquoise is mined all over the world. 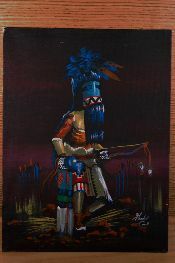 For over 43 years, Two Dogs Southwest Gallery has developed business and personal relationships with over 2000 of the finest Native American Artists. Our relationships have allowed us to personally meet with and hand-select each Turquoise piece we offer to you. We carry one of the largest selections of Turquoise earrings, Turquoise belt buckles, Turquoise pendants, Turquoise necklaces, Turquoise bracelets, Turquoise rings, Turquoise Watches, and Turquoise bolo ties, plus much more. To learn more about the different types of Turquoise and other gemstones used to create Authentic Native American Jewelry, we invite you to visit our About Stones page. Turquoise, chemically, is a hydrated phosphate of copper and aluminum and is formed by the percolation of meteoric or groundwater through aluminous rock in the presence of copper. For this reason, it is often associated with copper deposits as a secondary mineral. Turquoise is most often found in arid, semiarid or desert places such as Iran, Tibet, China, Australia, Mexico, Russia, Turkestan and the United States. 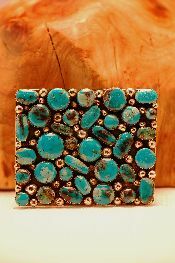 Turquoise gets its color from the heavy metals in the ground where it forms. 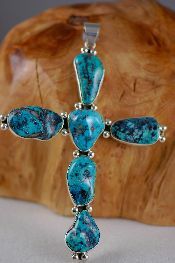 Blue turquoise forms when there is copper present, which is the case with most Arizona turquoise. Green turquoise forms where iron is present, the case with most Nevada turquoise. Matrix is the host rock, mother rock. It can be made from several different elements such as pyrite, chert, quartz, cuperite and manganese oxide. The sought after spider web turquoise is made up of small nuggets naturally cemented together with rock or matrix. When cut and polished the stone resembles a spider web. So many geologic chains of events must synchronize to create just one thin vein of turquoise that the mineral can rightly be envisioned as a fluke of nature. Turquoise is the rare and improbable product of an incalculable number of chemical and physical processes that must take place in the right combination and proper environment over a time span of hundreds of thousands - if not millions - of years. 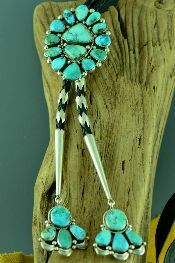 Click here, to learn more about turquoise native american jewelry. 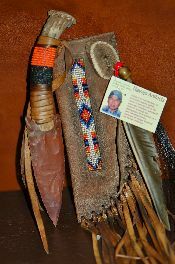 The Indian Arts and Crafts Association was established in 1974 in response to the growing problem of misrepresentation of American Indian jewelry, arts and crafts in the marketplace. 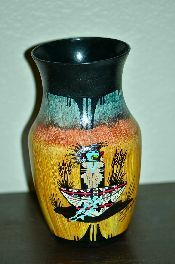 The original founders were American Indian artists and reputable businesses located primarily in the Southwest. Today, IACA is an international organization representing every link in American Indian arts – Native artists from the U.S. and Canada, along with consumers, retailers, wholesalers, museums, government agencies, suppliers and supporting members. In the early 1970s, the American Indian jewelry and arts industry was booming. And, as so often happens with successful businesses, unscrupulous dealers, knockoffs and imported goods appeared in the market to the detriment of the unsuspecting consumer and respectable artists, wholesalers and retailers. 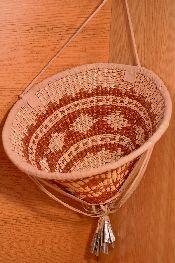 Legislation governing the industry and the labeling of authentic arts and crafts produced by Native Americans was weak or non-existent. Where it did exist within several of the States, it was rarely enforced. Realizing that if these conditions were to continue, the buying public would soon lose confidence in the intrinsic value of Native American Indian products, these individuals did what people in similar circumstances have done since ancient times. Rather than face the issue privately, they banded together and founded the "Indian Arts and Crafts Association" and incorporated it under the laws of the State of New Mexico. 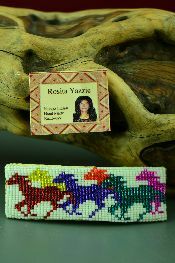 Two Dogs Southwest Gallery is a proud member is the IACA and only carries authentic Native American jewelry and artwork. 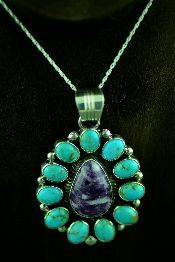 We represent hundreds of Native American Jewelers who create some the finest jewelry that you will ever see. All of our items come with a Certificate of Authenticity. You can be confident when purchasing from us because your purchase comes with a 100% Satisfaction Guarantee. The majority of our customers love our jewelry and rarely do we ever have anyone return what they have purchased. 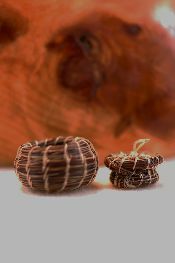 In the event of a return, it is usually due to size rather than quality.